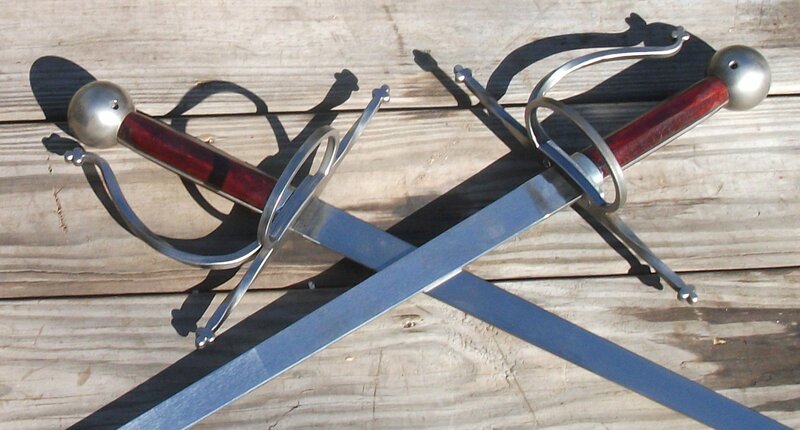 The above is a photo of two of our Meyer rapier hilts mounted on flat tang blades. This design dates from the 16th century. Our hilt consists of an 10 inch long cross guard, two open (unfilled) side rings, and a knuckle guard. The two examples above have their left side rings removed. The side rings measures 3 inches long by 2 inches wide. The wooden grip is approximately 5 1/4 inches long. This hilt may also be mounted on a dagger blade. There is a shopping cart button below for ordering this hilt mounted on a dagger blade. If you are ordering a hilt and blade to be shipped to an address outside the US, send us an email at alchem@en.com with the hilt type, blade length, and destination, and we'll calculate the shipping cost. Please note: If not specified, the default ia gray. Please note: If not specified, the default is 36 inches and straight.